Spring 2013 saw Carbon collaborate with long-term partner Tethr and Arc Finance to produce concept designs to track the performance of microloans for solar energy across India and Uganda. Our relationship with Tethr focussed on packaging and aggregating various technologies into an appliance that could bring communication and connectivity to distressed, crisis stricken areas. Arc Finance’s role was to provide was to providing an infrastructure for microloans to various rural Indian and Ugandan communities, enabling them to purchase install and manage solar generators. 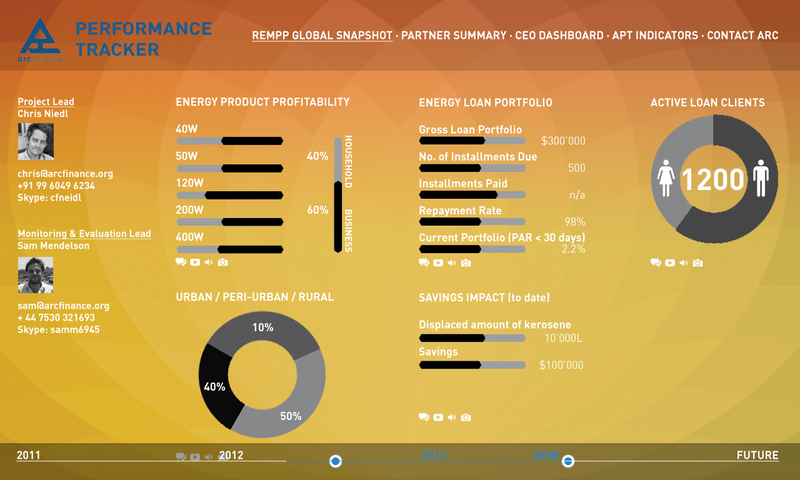 Carbon provided Arc with concept designs for a management dashboard, providing a global snapshot of financial performance and energy consumption, summaries of activity from each community as well as the environmental impact of switching to solar.